The exodus tabernacle in the wilderness was made following the architectural design given to Moses by God. Moses tabernacle was God's dwelling place on earth, God's sanctuary. 8. And let them make me a sanctuary; that I may dwell among them. 9. According to all that I shew thee, after the pattern of the tabernacle, and the pattern of all the instruments thereof, even so shall ye make it. 44. Our fathers had the tabernacle of witness in the wilderness, as he had appointed, speaking unto Moses, that he should make it according to the fashion that he had seen. The daily and yearly services pointed to Christ's sacrifice on Calvary and the judgment. The design is based on the Heavenly sanctuary where Jesus now officiates as the Heavenly High Priest. The design for the tabernacle was given to Moses the same time he received the ten commandments. 12. And the LORD said unto Moses, Come up to me into the mount, and be there: and I will give thee tables of stone, and a law, and commandments which I have written; that thou mayest teach them. 15. And Moses went up into the mount, and a cloud covered the mount. 17. And the sight of the glory of the LORD was like devouring fire on the top of the mount in the eyes of the children of Israel. 18. And Moses went into the midst of the cloud, and gat him up into the mount: and Moses was in the mount forty days and forty nights. Just as we are required today to give offerings for the church, the Israelites had to give offerings for Moses to build the exodus tabernacle. 2. Speak unto the children of Israel, that they bring me an offering: of every man that giveth it willingly with his heart ye shall take my offering. In the courtyard , was the brazen altar of sacrifice, and the brazen laver. In the Holy part of the sanctuary was the golden candlestick, the table of shewbread , and the altar of incense. 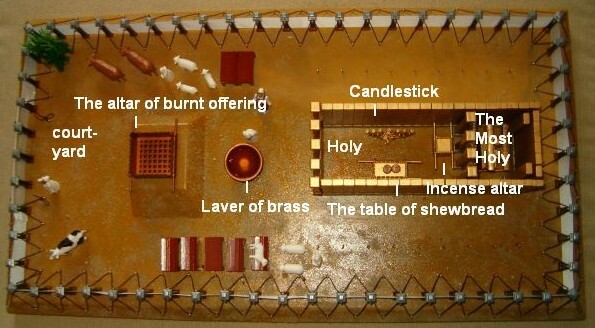 In the the Most Holy section of the exodus tabernacle was the ark of the covenant and the mercy seat were God resided. Once Moses finished the work on the exodus tabernacle, and set it up on the 1st day of the 1st month, the presence of God came upon the exodus tabernacle. 34. Then a cloud covered the tent of the congregation, and the glory of the LORD filled the tabernacle. 35. And Moses was not able to enter into the tent of the congregation, because the cloud abode thereon, and the glory of the LORD filled the tabernacle. 37. But if the cloud were not taken up, then they journeyed not till the day that it was taken up. 38. For the cloud of the LORD was upon the tabernacle by day, and fire was on it by night, in the sight of all the house of Israel, throughout all their journeys. "The Great Controversy" is both a historical and prophetic book. The historical portion starts with the destruction of Jerusalem as described by Jesus in Luke 19:42-44, the Waldenses, John Wycliffe, Martin Luther and other reformers. The prophetic portion deals with the prophecies in Daniel and Revelation, and Christ's promised second coming. 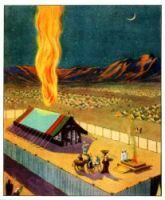 The exodus tabernacle was portable, because the Israelites were wandering in the desert for 40 years. So they had to take it down when God said move, and re-erect it when God said stop. 50. But thou shalt appoint the Levites over the tabernacle of testimony, and over all the vessels thereof, and over all things that belong to it: they shall bear the tabernacle, and all the vessels thereof; and they shall minister unto it, and shall encamp round about the tabernacle. Click here to read about the daily sanctuary services of the exodus tabernacle, a shadow of the heavenly. Christ is the high priest of the heavenly tabernacle.